My compositions tend to be sparsely rather than densely textured. I enjoy unusual combinations of sounds - I am happier writing for didjeridu, hammered dulcimer and bells than for a string orchestra. I love percussion, and also love the human voice. I enjoy quirky melodies, arresting harmonies and challenging rhythms. Judith Clingan A.M. is a multi-faceted artist equally intrigued by sounds, words, movement and things visual. Born in Sydney in 1945, she was not taught music, but spent her childhood singing, playing recorder, drawing, painting, and writing stories and songs. On leaving school, she studied languages at ANU while continuing to indulge her passion for all things creative. 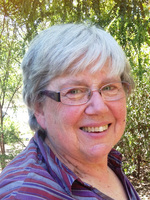 In 1967 she founded the Canberra Children's Choir (now Canberra Youth Choir), and, discovering an alarming lack of interesting music for SSA voices, began composing for them. Along the way she studied music part-time, mostly at the Canberra School of Music: voice, bassoon and composition. In 1970 she founded what is now the Young Music Society: for 10 years she directed holiday music schools for hundreds of children. From 1972 - 1974 she lived in Hobart, studying art, painting, teaching and conducting. Her daughter Jessica was born in 1974. Being the mother of a young child focussed Judith Clingan's attention on the musical education of young children. She studied at the Kodaly Institute in Hungary from 1981-82 and, on her return to Canberra in 1983, she founded the community performance and tuition group Gaudeamus (which morphes into Music for Everyone, which is now a part of Music for Canberra.) For Gaudeamus she composed, and commissioned from other Australian composers, many choral and music theatre works. In 1989 Clingan was the Creative Arts Fellow at the ANU; in 1991 she was an Australia Council Composition Fellow. Gaudeamus performers toured her music theatre work Kakadu (1990) to Finland and the work won a Sounds Australian award in 1991. In 1991 she became involved with Steiner education, and since then has written many short choral and music theatre pieces for use in Steiner schools. Also in 1991 she was chosen to be the inaugural Canberra Times Artist of the Year. From 1994 - 1996 Clingan worked in South Australia, founding Voicebox Youth Opera, for whom she wrote many music theatre pieces. She returned to Canberra in 1997, and founded the choir Wayfarers Australia, and the vocal octet Variables. In 1999 she travelled to Europe on a Churchill Fellowship to investigate music theatre; in 2001 she was awarded an artsACT Creative Artists Fellowship. Some of her choral pieces have been released in the CD Choralations; her pieces for use in schools and community groups can be found in the Songs of the Tree of Life books and CDs. Judith Clingan is currently based in Canberra, composing, conducting, teaching and performing, as well as organising and directing choral and music theatre holiday schools, music education courses, and choral, recorder and music theatre performances. She also makes frequent forays to other parts of Australia and to Europe to teach and perform both old and new music. Currently (2016) she is about to take a group of her international performance troupe Wayfarers to perform in the Edinburgh Fringe - her music theatre version of Saint-Exupéry's Le Petit Prince will receive its premiere at the Fringe. Truths? : for SATB choir with violin (2016) Commissioned by Rowan Harvey-Martin. A sparrow's Noel : for children's choir (SSA) and cello or double bass (1990) Commissioned by Canberra School of Music Community Choir. Kakadu (sab choir with chamber ensemble) (1990) Commissioned by Gaudeamus A.C.T.